Machines offered are single phase AC for seam welding of Drums and Barrels, Fuel Tanks, Silencer, Muffler, Shock Absorber etc. SPMs are offered for applications such as fully automatic barrel and shell welding, tub welding, fuel tank welding etc. 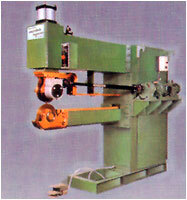 We also offer 3 phase, DC machines with matching controls for special applications. with PLC can be supplied. A variety of electrodes and tooling can be offered to suit every application.